Started on fixing the hooked bottom. By started I mean thinking about the approach some more and deciding how far forward from the transom I am going to address. I took an 8 foot straight edge and laid it out on the boat with the leading end at about two thirds of the length of the hull, the other end extends past the transom. At it's deepest the hook is about 3/8's of an inch. Pretty deep. 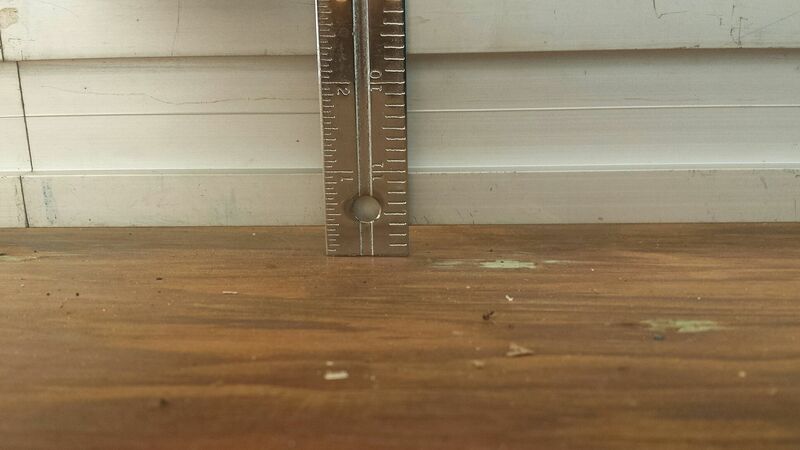 I'd like some opinions on how far forward of the transom the planing surface should run. I'm thinking the length represented by the position of the straight edge in the photos below. On a side note, in the first picture, note the long pieces of mahogany hanging high up on the wall. They go on the floor along the edge. When the day comes that I am reinstalling them, I'll know I've made progress! 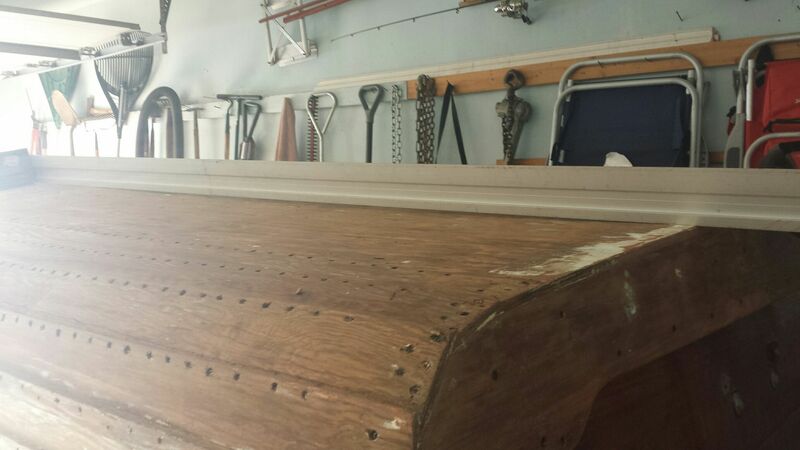 I am by no means a boat builder and even still have trouble with some of the terminology, BUT just looking at it from a practical viewpoint, since the hook is established in all the wood, (inside to outside) it would be very difficult to straighten all of it out because there is a lot more structure on the inside. Why not just loosen the outside boards from the inside boards and put spacers in between them and screw them back together.? This is just a layman's view. Bravo. Rich and I are advocates of this approach as well. See recent posts on Hooked Bottom thread. I thought a lot about the approach of shimming the bottom from the inside as you guys described in the other threads etc. I didn't want to get into more disassembly of the structure, so I was spending more thought on the "fill the hook from the outside approach". A few nights my son and I were hanging out an I laughed, saying "the forum disproves of my approach". That lead to 45 minutes of discussion about how we could shim the bottom vs. the fill in approach (15 minutes of that laying on the garage floor under the boat). It's great to have an engineer for a son. A lot of the discussion was around the fact that the keel is hooked as well. I had never really resolved how I was going to address that. So, now I am thinking shimming is that way to go, other than a full bottom disassembly and a structural rebuild. "The curve appears to be between an inch and and inch and one half is all. The boat would actually handle being driven like that as I used to have a boat that was much worse until I repair it. What I did back then was to secure a 4x4 across the top of the boat, start soaking the boat with an old quilt continuously kept wet in the general area of the bend and then use a farm jack, (about $60 at fleet farm) to start bringing pressure on it... It took me a couple months if memory serves me right but it did work and for the most part straightened it out. An old timer had told me how to do that... I "
Now I recognize that none of the viewers of these threads could be categorized as Old Timers, but here is the advice of a fellow who claims to have done it via the pressure method. I remain a shim/spacer advocate, but it seems there is mileage for other approaches as well. Back to you, Peter. Keep us posted! Started in on it last night. Removed the non-original floor stringers that I had put in when I got the boat (2006) for easier access for installing shims. Also started on removing the fasteners. I don't expect i will be able to reuse most of them as they will be too short after shimming, but I am taking care not to damage them. Other ideas are coming along as well I lay under the boat looking up. More as it goes along. Haven't abandoned the project. Just been busy with other demands, like a week's vacation in Florida! I've shifted my time to building a shed under the deck/sun room for when the "too cold to work on the hull" weather gets here and i wanna park my car in the garage for a change. That said. I am still waffling back and forth between unfastening all the bottom structure and shiming it vs. epoxy glued strips of white oak sanded fair to fill in the hook. 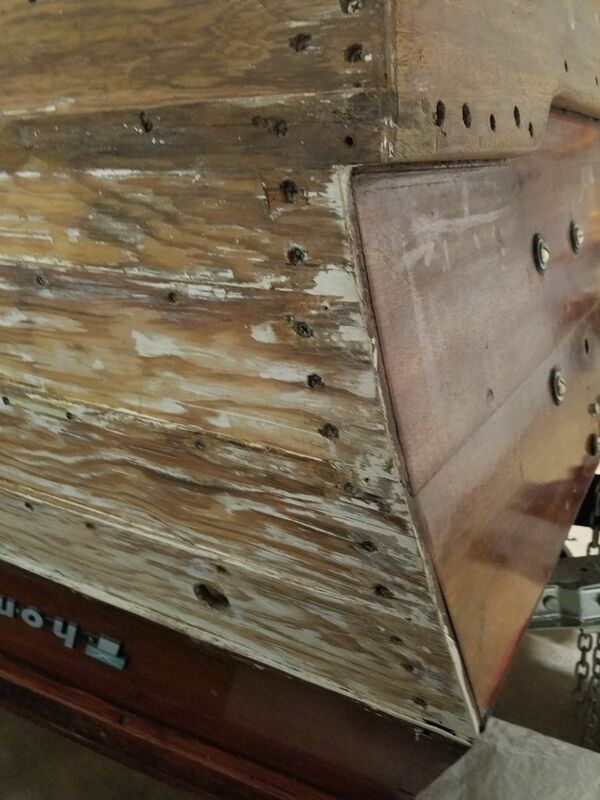 Hi Peter - I do not know the original construction of your boat, but if I am seeing the photo correctly, it looks like there is already a spacer board between the bottom of the ribs and the bottom of the boat located halfway between the inner keelson and the stringer. Do you know if that is original or did someone already insert a spacer (or am I not looking correctly at the photo)? What you see is the original construction. Thompson of Cortland New York (aka Cortland boats) of my vintage were constructed differently than most of the boats of that era that I am familiar with. 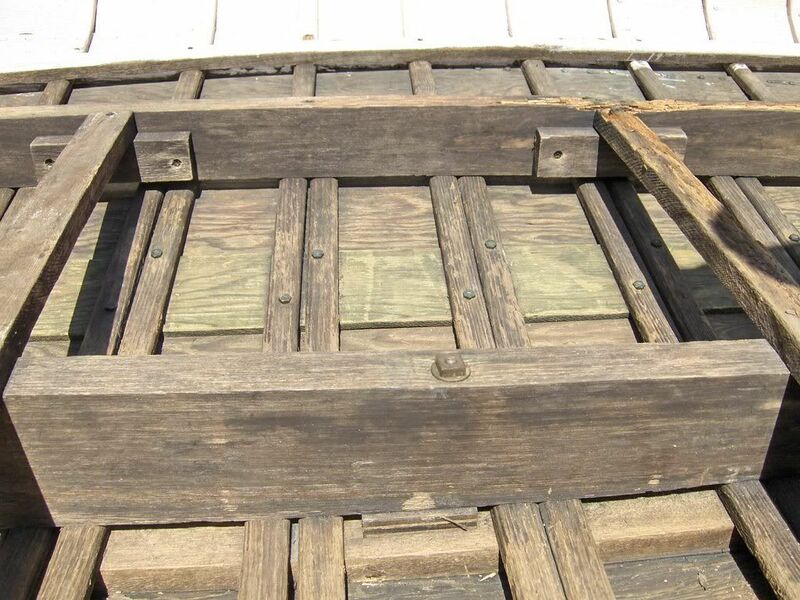 Instead of the frames running down to and ending at a once piece Keel, the frames in the Cortland boats ran down and across the bottom of the boat and up to the sister keelson on the other side of the boat. The framed ran between what I call the ' keel board' ( that board on the bottom to which the garboards are screwed) and the ' main keel'. This doubled the frames across the garboards, and kept the ends of the frames up out of the bilge water. The extra space between the frame ad garboard allows water and minor debris to flow easily to the back of the boat. I believe they called this feature a "fully vented keel". 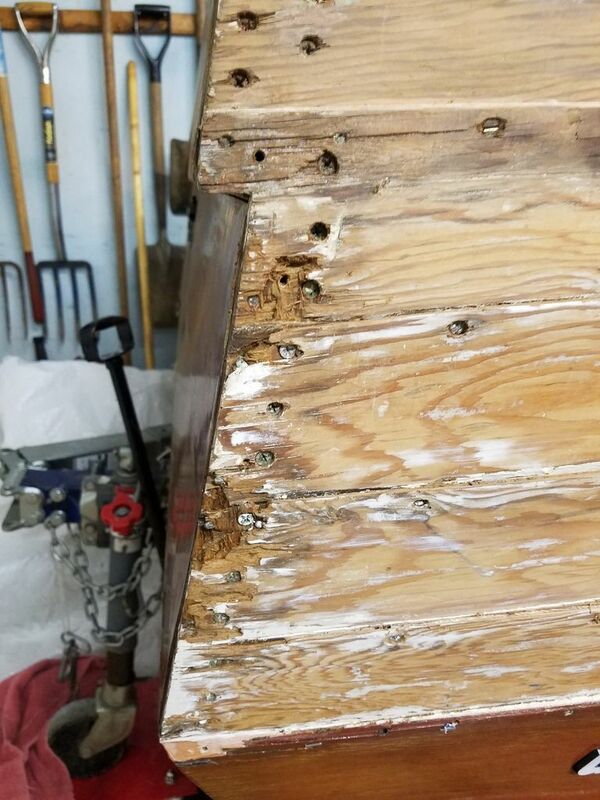 That small block of plywood that is the picture is in place at each location where a carriage bolt goes through then main keel, the keel board, the bottom, and the outer keel. Likely there to allow the bolt to be tightened down without deforming the keel board or outer keel. 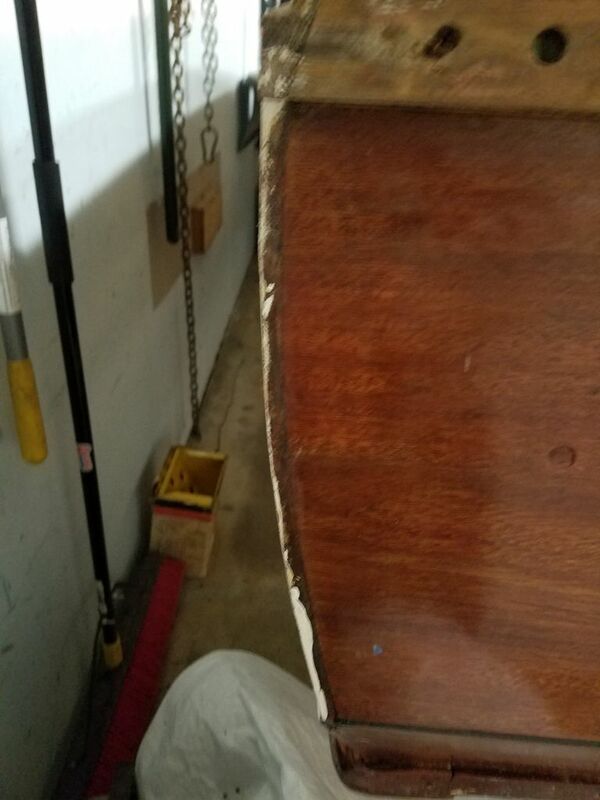 I was concerned that the Keel Board would be screwed or nailed to the frames, thus making it difficult and risky to attempt to shim the bottom. However, I am a member of a Thompson boats group on facebook, and recently a guy posted pictures of a Cortland boat he is rebuilding (the entire bottom and framing). I asked him if the 'keel board' was nailed or screwed to the frames, to which he said on his boat they were not. So I am back to shimming (for now). 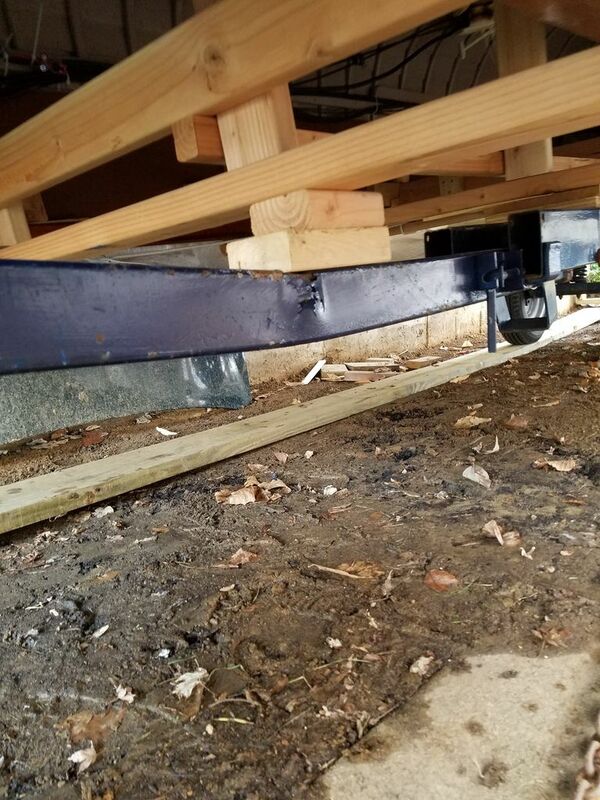 Problems in paradise - I was moving the boat around back (so I can park my car in the garage during the winter) and with out going into details, it slipped off the trailer dolly and slammed to the ground and bent the main beam of the trailer. Can it be bent back straight without weakening it? Last edited by thegammas on Sun Jul 02, 2017 7:24 am, edited 1 time in total. Your best bet is to take it to a shop that specializes in straightening car frames. They will know the best way to treat it. 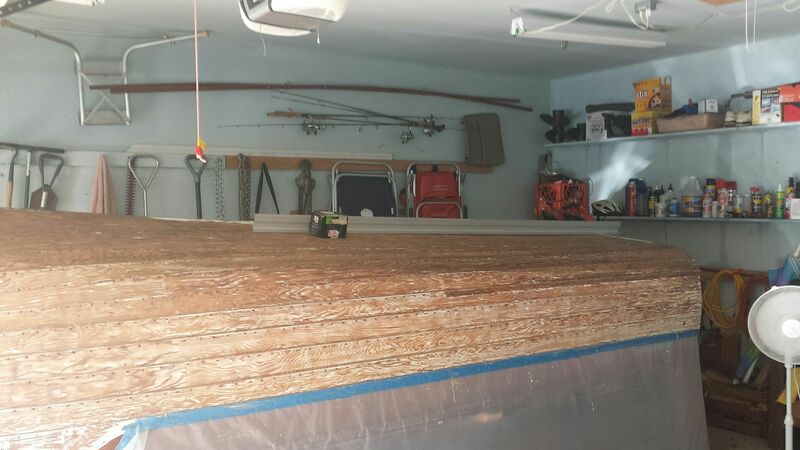 Last weekend my son and I brought the boat back into the garage from around back where it has been since November or so, under the deck, covered, sitting on a dirt floor. Even though life is busier than ever, I hope to make some progress on it this summer. 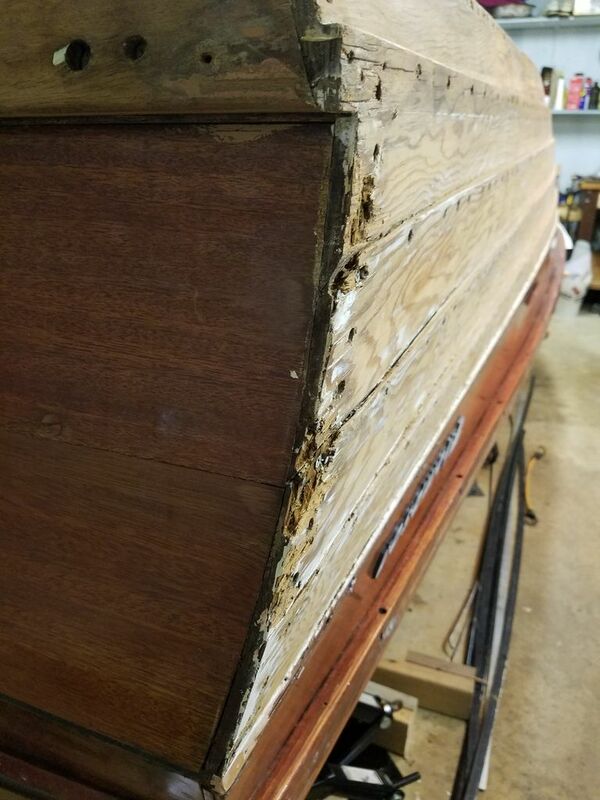 If you read back through this thread you will see that I have two primary challenges, a hooked bottom and some rotted plank ends at the port side transom. At the end of the season last year I had made it to the point of removing most of the garboard panel fasteners from the frames and keelsons in preparation for shimming the bottom to remove most of the hook. Last weekend I laid my long straight edge on the bottom to check the hook, and it is all but gone. I'm thinking that the bracing I have in the boat that transfers the weight of the boat to the keel and gunnels, and the boat having been in an not too damp and not at all dry environment for months relaxed the hook out. But now how do I keep it from coming back? About the plank ends - the Starboard side is fine. The plank ends are solid and thick enough that I have no concerns. Check out the Port side though. Thoughts? Good to see you getting back on it Peter. I'm not familiar enough with boat repair, but I'd think maybe scarfing in some short new pieces? Cutting the angles on the planks that are still screwed on might prove a tad difficult though. When you're done with that one, I have another project for you. Twist arm - twist arm!!! !